As a dealer in obscure motorcycles and cyclemotors, I do occasionally sell Winged Wheels. Personally, I don’t like them: though pretty to look at, they are much more hassle to work on than my favourite cyclemotor, the Cyclemaster. 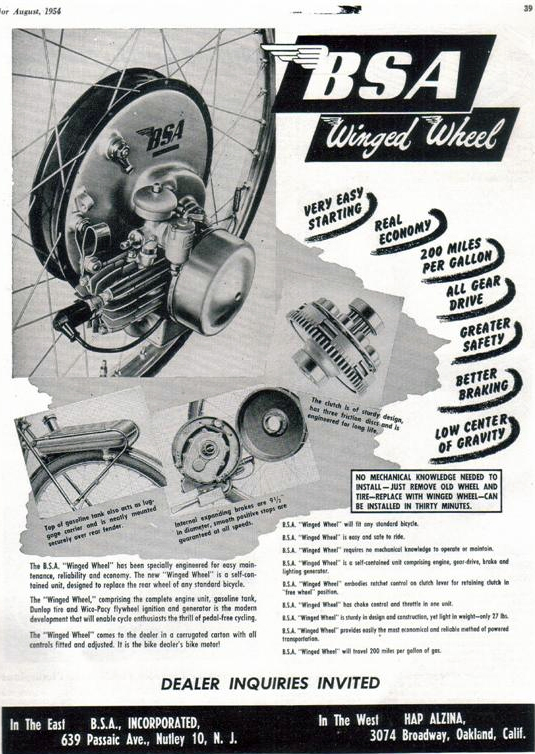 However, as one of many landmark BSA models, the Winged Wheel is important. So here’s its page. We built this one in summer 2009, and I sold it in October 2009. According to the logbook the engine is from 1954. BSA introduced them in 1953, and you could fit the engine to your own bicycle. Included in this sale is a photocopy of the original BSA Winged Wheel Instruction Manual you would have received with the engine. (Don’t strain your eyes: I’ve reproduced close-up pictures at the bottom of this page). Apart from an engine, what sets a motorcycle apart from a bicycle is the motorcycle’s ability to carry a passenger. But a tandem is different. Rather than a rider with pillion passenger, as on a motorcycle, a tandem requires a joint effort. The front rider of a tandem is known as the ‘captain’ or ‘pilot.’ The rear rider is the ‘stoker’ (during the war, known as the ‘tailgunner’). While a cycle tandem is dependent on both riders always using it together, a motorized tandem can be ridden without the stoker. But they say a tandem is not a tandem without the stoker. It’s certainly the combined team that makes tandem riding such a wonderful experience. The advantage of a bicycle is its lightness and the independence offered to the rider, and it’s obviously much easier to store than a tandem. Despite these disadvantages, normal vintage tandems are becoming increasingly collectible. They epitomize a period in Great Britain when cycle touring became very popular. Many couples in the 1930s used tandems for their holidays, and families would often fit their tandem with a child’s sidecar. While tandems were most popular before the war, cyclemotor engines such as this were a post-war phenomenon, introduced because new motorcycles were in short supply and bicycles were the most feasible form of transport. Though underpowered two up, fitting a 38cc BSA Winged Wheel to a prewar BSA tandem is therefore totally in keeping with that early 1950s era of austerity. 50-60 years down the road, there are now less than a dozen vintage motorized tandems such as this on the road in Great Britain. I’ve seen Powerpak and Mini-motor engines fitted to tandems, and there are some European versions around (I have a 1951 Narcisse, featured on the http://www.oldbike.eu website). I’m sure someone else must have fitted a Winged Wheel to their BSA Tandem, but I’ve not seen one. So, until proven otherwise, I will declare this pre-war BSA Lady Back Tandem powered by a 1954 BSA Winged Wheel as one of the most novel and interesting machines of its kind in the country. I bought the BSA Lady back Tandem last year. It’s in very good condition and I’ve ridden it. The previous owners used it regularly, and made some modifications for easier cycling. We’ve removed the modern gearing and rear rack seen below to fit the Winged Wheel engine. Non-original items are the front handlebars, handlebar grips and mudguards. I do have original ones on another BSA bicycle but it looks good and rides well as is, so I’ve not disturbed the current set-up. You can compare it with the 1939 BSA Lady Back tandem illustrated below. 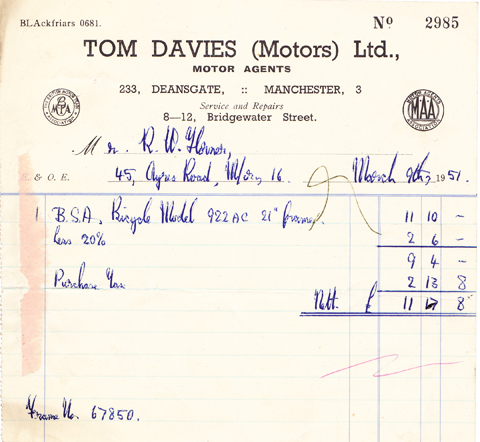 This Winged Wheel engine arrived in running order and DVLA registered, but fitted to a modern bicycle. So now you can see how and why this project took shape. What I like most about this rig is that it’s a manageable machine. I have some French tandems that are really heavy. They are annoying to use for that reason. This BSA tandem is nowhere near as lumpy, and because this cycle attachment engine fits inside the wheel it is still well-balanced. Good looks are all very well, but if you can’t use it nobody is going to see it! Matching Brooks Model B17 saddles at the front, above, and rear, below. We built this one in summer 2008, and I sold it in the first http://www.BuyVintage.co.uk auction later that year. BSA bicycles are becoming increasingly sought-after. BSA Delivery Cycles are particularly hard to find, so I jumped when I came across this one in Blaby, near Leicester. You can see a picture of the bicycle itself, as originally purchased, above. The first thing I did was replace the saddle with an authentic period one. I’d recently swapped an old VAP4 on a Dutch Wonder bike for a restored BSA Winged Wheel. I knew that the Winged Wheel would go perfectly in the BSA Trade Cycle. The heavy-duty frame of a trade bike is ideal for cyclemotorizing, because it can handle the extra velocity. I removed the sign from the cycle ready to have it repainted to advertise the Cyclemaster Museum. But I’ve not done so yet; it will be given to the successful purchaser who can then use it to advertise their own business. Since deciding a few weeks ago to sell most of my collection, and designing this website as a result, I’ve had little time to prepare individual vehicles for sale. So this BSA Winged Wheel Delivery Cycle set-up will be sold as restored, but untested. You’ll need to give it the usual servicing and preparation before putting it on the road. Sad to see it go. But I can’t keep them all. It’s exactly the kind of vehicle I love. I’m sure the new owner will get a lot of pleasure from it. I’ve got lots more Winged Wheel ephemera. When I get a spare moment I’ll add it.